Almost every coffee machine that is available in South Africa is a fully imported product. As such, the prices are directly proportionate to the varying and somewhat volatile ZAR (SA Rand) exchange rate. We all know how well that’s been doing lately! In addition to pushing up the price of coffee machines, this has done the same to virtually every machine or piece of equipment that is needed in a restaurant, hotel or coffee shop. The most obvious advantage is off course that you don’t tie up your business capital. This is freed up when you hire your equipment. The most obvious disadvantage is that you never own the machine. In our case this is not true. 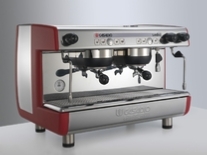 All our hire contracts include an option to buy the coffee machine at any stage. If you decide to do this, 30% of all hire fees that you have paid by the time of purchase will be deducted from the original value. You are therefore able to buy at any time without penalty. After you hire the coffee machine for a period of 36 months, you will be allowed to buy it for a value equal to the breakage deposit that you pay at the onset. In our experience, provided that you have hired a machine appropriate to your usage, your machines should still be in excellent condition after the 36 month period and will offer years of good service. Things change as life goes on. We don’t want any of our customers to be locked into a contract that no longer suits them. Customers can terminate the contract at any time by giving one calendar months notice. What could be more fair than that? We recommend the Jura E6 for small applications, the E8 for medium applications such as a B&B or Guest House and the Jura WE8 and the larger Giga range for large or busy applications. These are state o the art commercial machines with very good extractions rates. The machines are fully programmable and easy to use with one-button operations and easy maintenance. Engineered to exacting standards - we have dozens out on hire with a very successful track record. 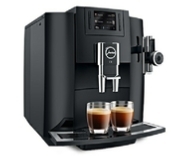 If it’s the bean to cup coffee machines that you are after, Jura has a machine to cater for every need. Every circumstance is different. We pride ourselves on many successful arrangements with professional business whether these are in the catering industry or office hire environment. Let us assist you in matching the right machine for your needs. Why should I hire from EL Coffee?